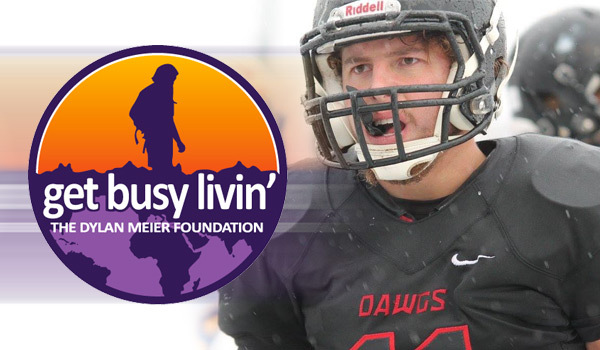 The Get Busy Livin’ Foundation, along with Kpreps.com, is pleased to announce Tucker Horak of Rossville High School has been named the 2015 Get Busy Livin’ - Kpreps Player of the Year Award winner. Horak said he knew little regarding the Dylan Meier Get Busy Livin’ Award when he earned nomination as one of the state’s six finalists. However, Horak talked with Rossville’s head football coach Derick Hammes and the school’s athletic director. A Pittsburg State football signee, Horak decided to research the recognition, given to just one Kansas football player a year. “Wow, it’s a special award,” he said. Then, Horak received a call from the Meier family telling he had won. “Really, I am honored and blessed,” he said. Horak led Rossville to back-to-back undefeated seasons, consecutive Class 3A state titles, and earned Top 11 all-state honors for all classes. In December, he was featured in the Faces in the Crowd section of Sports Illustrated highlighting his incredible season and the bevy of state records he set along the way. Still, Tucker calls the Get Busy Livin’ Award his highest honor. “It’s a special award with the kind of player and person that Dylan was,” Horak said. Well-known for his on-field accomplishments, Horak served on the community crew for the Rossville flood last summer. The night before, Horak and his family knew bad weather was coming. North of Rossville, multiple smaller creeks run into a creek that goes through the west side of town. “You just realize how truly blessed you are to be here from such a small town where everyone cares about each other,” he said. Rossville won the final 28 games of Horak’s career and, as a senior, he became the first Kansan with 2,000 yards rush and 2,000 yards passing in the same season. Rosville broke the single-season state record for yards (7,278) and completion percentage (75.7%). Horak played on the offensive line at center when he began his football career in elementary school. For the fifth and sixth grade teams, Horak and Isaac Luellen, both left-handers, were the quarterbacks. Luellen eventually became an all-state defenseive end and a two-time wrestling state champion, including a 46-0 record this past winter. Horak played junior high quarterback and then was moved to slot receiver as a freshman. When Hammes took over as coach, Horak returned to quarterback. He finished as Kansas’ career leader in total yards (12,834) and for a single-season (4,929). In Hammes’ tenure, Rossville has lost only one game and won the first two state football championships in the schools’ annals. In addition to the award, the GBL Foundation distributes several scholarships surrounding Dylan’s home community of Pittsburg. On Saturday, April 30th, the GBL Foundation hosted the sixth annual Dylan Meier 5-kilometer run at Hutchinson Field in Pittsburg. For more information on the GBL Foundation, go to getbusylivin.org. The other finalists for the award were Blake Beckett of Halstead, Brady Dinkel of Victoria, Logan Koch of Mill Valley, Will Mengarelli of Pittsburg, and Ryan Menghini of Frontenac. Past winners of this award were Bishop Carroll’s Denzel Goolsby in 2014, Shawnee Mission West’s Austin Chambers in 2013, Lawrence’s Brad Strauss in 2012 and Madison’s Kole Schankie in 2011. A number of players from each classification were originally selected as candidates based on exceptional on-field performance. Coaches were then solicited for information about the players’ character, school performance, community involvement and hobbies. From those submissions, the GBL Foundation narrowed the group to six finalists. Each of the finalists’ answered a series of questions. From the questions, the Meier family and the GBL Foundation board selected Horak as the winner.